Apple Macintosh computers are preferred for their impressive performance, ease of use and innovative features. However, your Macbook or iMac is, after all, a device and with time, maintenance and repair can be required. With prolonged usage, the startup disc of your Mac-based desktop or laptop may get full and that is when you start seeing the message “Your startup disk is almost full.” Until disk space is freed up, this message will keep popping up from time to time. 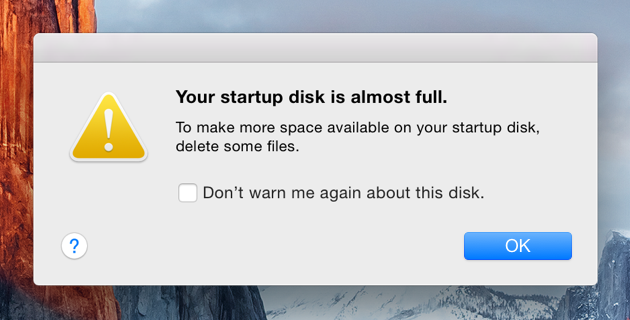 When you get alert popup alerting you about mac startup disk full, do not fret. Apparently, you may think deleting less important files can free up disk space. The startup disk is a part of HDD or SSD in the device and this is where the Mac OS is stored. When 85% of the partition is full, you are likely to see the alert message. It is also necessary to take back up of your data before starting the cleanup process. At first, launch the Finder utility and choose list view. Choose View-As List. Delete the files you think are occupying excess space. You can also resort to Mac OS’s scheduled maintenance. It is possible to run the utilities on a daily, weekly or monthly basis. Access Applications and go to Utilities. Then type in ‘a. Sudo periodic daily weekly monthly’ using the Admin account. Then Press Return and type in Admin password and once more press Return. Manual cleanup is more flexible and gives you control over which files you want to delete. However, performing manual cleanup is quite time-consuming. At first, choose System Preferences -> Users & Groups. Then, click the username and select Login Items tab. With "-" symbol remove these startup items. Restart the device for changes to apply. Mac OS Sierra has built-in utilities for cleanup of disk and optimization of storage. For a more comprehensive cleanup- using suitable Third-party apps is better. However, you should choose such third party Mac disk cleanup tools after proper assessment and comparison. They may also offer added benefits like improved system performance and reduced delay in booting. So, you can resort to many measures to cope with alert messages showing mac startup disk full. For casual Mac users, the manual approach is the best. However, the power users can prefer the feature-laden third-party apps for the same purpose.